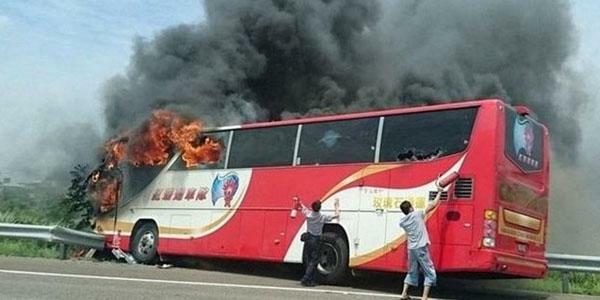 A tour bus burst into flames on a highway near Taiwan's capital on Tuesday. It was carrying visitors from China. The accident took place on the No. 2 national highway in Taoyuan county, south of Taipei. The group of Chinese tourists was going to Taoyuan Airport to catch a flight back to Dalian. "The fire moved very fast. All 26 died." Lu Jui-yao, an official with the National Highway Police Bureau told. Pictures from the scene showed thick black smoke and flames engulfing the bus. Both of the bus's doors were pressed up against the highway's guard rail, making them impossible to open. The cause of the crash was not immediately known. Taiwan authorities are still investigating.